Leadership supporters join a passionate community of individuals dedicated to making our lives better and our communities stronger by saving the places that shape the American experience. They invest $1,000 or more per year to help the National Trust save the past and enrich the future, so that all Americans can live, work, worship, and play in strong, vibrant places enriched by a sense of history. 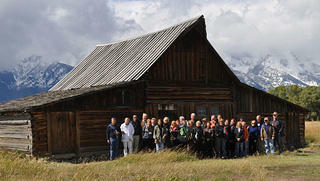 National Trust donors at Grand Teton National Park.